Inspiring Art Teachers to Explore Art History | Curator’s Corner: Monotypes! Please share your monotype/monoprint experiences. Which do you prefer to teach your students? What types of surfaces do you use to transfer the colors? Have you ever tried doing one monotype over another like Mazur? If so, how did it come out? Did you ever try a large-scale monotype? A monotype is usually conceived of as a small-scale, intimate medium, due to the tenuous nature of the original surface from which the print is taken. Because the surface of the plate is featureless (no marks made on it), only one print is available in this process. A monoprint uses a surface that has marks in it made with a burin or other tool. Michael Mazur is an artist renowned for his monumentally scaled monotypes, who exhibits internationally. 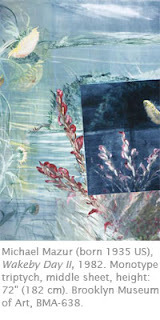 Mazur’s complex monotypes are the result of multiple monotypes on one receiving surface, whether it is paper or canvas. The plate is wiped off after one image is transferred, and another design is printed over the initial one, creating a sophisticated depth to his work. He sometimes makes additions to the monotype in pastel or other media. Mazur brings to the printed image the spontaneity and immediacy of painting. Inspired by the monotypes of Edgar Degas, Mazur has used the phenomenon of “ghosts,” the pale residual images that monotypes can produce, to explore serial or narrative ideas in which the image evolves from sheet to sheet. Wakeby Day II is part of a series inspired by the artist’s memories of Wakeby Lake on Cape Cod. Basing his composition on memories gives the work a lyrical quality. The inset panel on the two right panels represents a nighttime view of the same scene, a device through which the artist explores the passage of time, the rhythms or nature, and the multiple layers of a memories and a single experience.